Abdullah Abdullah is no typical Afghan power-broker – seeking a sweet deal from Karzai or backing his threats with cadres of rifle-carrying followers. In many respects, Abdullah is a uniquely complex character in Afghan politics. By nature, he is more technocrat than holy warrior. Abdullah wants power in Afghan politics to be disbursed more evenly among the president, legislature, and local authorities. Abdullah's assessment: Afghanistan's centralized government goes against the country's political traditions and is in part responsible for the lack of law and order in rural areas. Dr. Abdullah Abdullah son of Ghulam Muhayuddin Khan (senator of the last period of Parliament) was born on Mizan 15th, 1339 (1960) in a religious family in Kabul. Abdullah's father from Kandahar region was a Pashtun — an ethnic group that comprises 42 percent of the population and accounts for the overwhelming majority of Taliban ranks. Abdullah Abdullah said his father was a Tokhi by tribe from Zabul province, who lived in Kandahar. His mother was Tajik, an ethnic group in the north that makes up 27 percent. Despite a Pashtun heritage, Abdullah is widely perceived as a northern Tajik because of his intimate association with the Northern Alliance. Abdullah's close ties to the Alliance would make it more difficult for him to reach out to the Taliban than Karzai, who was born in the Taliban heartland of Kandahar province. His primary education was in Mohd. Ayob Khan School and graduated from Naderia High School in 1355 (1976). He joined the medical faculty in 1356 and earned his degree in 1983. He was at service in Noor hospital as an eye Doctor until 1363. He immigrated to Pakistan in 1363 and worked as an ophtalmologist at Syed jamal-ud-Din Hospital. In 1364 he joined the fronts of Jihad and served as the health in charge of Panjsher front and afterwards as an advisor to Ahmad Shah Masood until Kabul was freed. From 1992 to 1996 he was the Chief of the staff and spokesman for the Defense Ministry. In 1997 he was the deputy foreign minister. In 1999 he was the acting foreign minister. 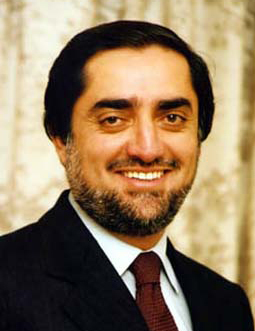 After the fall of Taliban in 2001, he was the foreign minister during interim and transitional periods. On May 6, 2009 Abdullah registered as an Independent candidate for the 2009 Afghan presidential election. He has selected Humayun Shah Asefi as his First Vice President and Dr Cheragh Ali Cheragh (a Shia Hazara surgeon from Kabul) as his Second Vice President.. He came in second place with 30.5% of the total votes. On November 1, 2009, Abdullah quit the runoff election that would have taken place six days later, on November 7, due to large-scale allegations of fraud against his opponent Hamid Karzai. In 2010 Abdullah created the Coalition for Change and Hope which is the leading democratic opposition movement in Afghanistan. Second vice president, Mohammad Mohaqiq (Hazara). Presidential runner Mohammad Shafiq Gul Agha Sherzai formally announced support for frontrunner hopeful Dr. Abdullah Abdullah on 3 May 2014. On Sunday (20140511) afternoon during a press conference, Zalmai Rassoul, the third leading candidate in the preliminary round, endorsed frontrunner Abdullah Abdullah. Rasul's first-vice-presidential running mate -- Ahmad Zia Masud, an ethnic Tajik and brother of Ahmad Shah Masud -- has reportedly given his backing to Ghani. Wahidullah Shahrani, Qayoum Karzai's First Vice President, was perhaps the most high-profile individual to endorse Abdullah on 20140606. A number of prominent political parties with influence across the country also joined Abdullah's cause. Hizb-e-Wahdat-e-Islami Party, under the leadership of Mohammad Akbari; Shuray-e-Etefaq Wa Dawat, under the leadership of Kahlid Pashton; and Shuray-e-Ayenda Sazan Afghanistan and Shrayy-e-Sulh Warzesh, under the leadership of the Afghan Olympic Committee Chair Mohammad Zahir Akhbar were among the groups that announced endorsements 20140606. Dr. Abdullah is being supported by his Reform and Unanimity team members such as Zahir Aghbar, Sardar Rahman Oghli, Fazal Ahmad Manawi, Khalid Pashtun, Dr. Sahak, Bashir Farooq, Amrullah Aman, Fazlurrahman Orya, Ali Farhad; Mirwais Yaseeni, Abdul Jabbar Shelgari; Mujib Rahman Rahimi and Muslim Saadat are two Abdullah's spokesmen. New National Front Afghanistan chief Anwarul Haq Ahadi has joined forces with presidential candidate 2019 Dr. Abdullah Abdullah’s electoral team, sources said on Thursday Apr 4, 2019. He is convenient with Dari, Pashto and English he also knows Arabic and French. The High Office of Anti-Corruption of Afghanistan on 20151128 declared a list of properties in possession of the Chief Executive Officer (CEO) Abdullah Abdullah. The list was declared in a report by published by state-run Anis Daily newspaper as part of a practice to announce the properties and belongings of high level government officials. CEO Abdullah was born in 1960 and holds a degree in medical field, according to a report by BBC Persian, citing the report published by Anis Daily. He initially started serving as Foreign Affairs Minister in late 2002 and later started work as Secretary General of Ahmad Shah Masood Foundation, opposition leader and Chief Executive Officer in national unity government. According to the report, CEO Abdullah’s wife and his four children currently reside in India and their academic expenses include $460 to $530 each on annual basis. They are paying $1,500 in home rent and their living expenses include $930 on monthly basis which include expenses for water and electricity as well. The report by the High Office of Anti-Corruption also covers total properties which is equivalent to over $153,000 and he owns $7,000 in Bank Al-Falah branch in Kabul. Regarding the jewels CEO Abdullah is currently possessing includes a watchcase worth $6,700 and another watchcase worth $4,600 and he has received both of them as present. CEO Abdullah’s wife is also having a gold watch worth $7,400, the report said, adding that his fleet of vehicles include an armored car worth $100,000, another car worth $20,000 but the values of each vehicle have depreciated to $60,000 and $8,000. The report also added that CEO Abdullah’s wife has a car which was bought for 1.3 million Indian rupees but it’s value has depreciated to 800,000 Indian rupees now. His other properties include a house in Kart-e-Parwan acre of Kabul city and one acre of land in Paghman district of Kabul which are both registered in his wife’s name (Fakhria) and the properties registered in his own name include a garden in Paghman district and guesthouse in Panjshir province. He has also declared that his current earning include AFN 298,000 as monthly salary and AFN 100,000 as monthly expenses from the government and has no other income, according to the report.